Exporters' association FIEO has raised concern over the slowing pace of exports growth though overseas shipments from the country again showed double-digit growth in July. 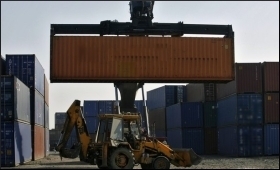 Reacting to exports data for July, FIEO President Ganesh Kumar Gupta said that consecutively for third month in a row exports have shown double-digit growth, however the rate of growth has declined. MSME units particularly labour-intensive sectors such as marine products, RMG of all textiles, cotton yarn/fabs/made-ups, agri products, leather & leather products and Handicrafts are into negative territory, he said. Though some of the labour-intensive sectors including gems & jewellery, carpets and jute manufacturing including floor covering etc. have either shown impressive growth or have improved, he added. The main reason behind the impressive growth shown by gems and jewellery exports have been the increased import of gold and pearls, precious & semi-precious stones. SME sectors of exports are still reeling under pressure because of the liquidity crunch as banks and financial institutions have continuously been tightening their lending norms and ITC refund for exports still poses a challenge, said the FIEO President. Gupta added that significant contribution in the growth was made by petroleum, gems & jewellery and engineering sector of exports, as they not only outperformed all other sectors of exports but has also helped the exports sector to continue on its double-digit growth trajectory in these difficult times. 21 out of 30 major product groups were in positive territory during July. Besides petroleum, gems & jewellery, and engineering goods, organic & inorganic chemicals, electronic goods, plastic & linoleum and drugs & pharmaceuticals etc. have also shown positive exports growth during the month. FIEO President again reiterated his concern on the rising trade deficit, primarily on account of swelling of crude imports bill due to rising global oil prices, which have further added to inflationary conditions and the current account deficit thereby adding to the woes of the government on the fiscal deficit front. This is also adding pressure on Indian Rupee coupled with huge withdrawal by FIIs from the Indian debt & equity market. Gupta said that on domestic front, key issues like depreciating rupee, access & cost of credit especially for MSMEs should be looked immediately as global challenges and increasing protectionism, have already added to the problems of the exporters. FIEO also urges the government to soon come out with WTO compliant export strategy to give a boost to country’s exports sector. The Rupee depreciation would definitely provide some edge to Indian exports as Rupee is the worst performing currency in Asia in the current fiscal, yet its impact will vary from sector to sector. However, the textile industry may be at a disadvantage with sharp depreciation in Turkish Lira as Turkey is one of the competitors. Same is true for commodities as Argentinian and Brazilian currencies have depreciated at a steeper pace, added the FIEO chief.